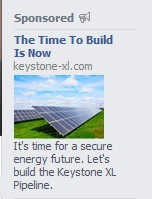 Wow, Keystone XL Is Solar Panels! Holy cow, this has got to be one of the crazier stories of the year. It’s also a clear sign that solar power is extremely popular… and a tar sands oil pipeline is not. If you follow green news at all, you’re surely familiar with the proposed Keystone XL tar sands oil pipeline. Even if you simply follow general US political news, you should be familiar with it. Basically, if you aren’t familiar with it, it is a pipeline that would be built by TransCanada and would transport tar sands oil (extremely dirty and corrosive oil) from Canada down to oil refineries in the southern US, from where it would mostly be shipped to China. It has been heavily opposed by a variety of movements. So, it’s a little surprising that a TransCanada website for the pipeline is being advertised on Facebook with a picture of solar panels! Yes, solar panels. That just about the opposite of what the Keystone XL represents. Philip Radford, executive director of Greenpeace USA, as well as some of his colleagues apparently spotted the Keystone XL solar panel ad this week. 30% less than regular electricity. That is indeed a steal. And it explains why DC has the 2nd-best solar return on investment (ROI) in the country. But even beyond DC and Hawaii (#1), solar power saves people enough money to buy an electric car in dozens of states. That explains why so many people are switching to solar power. Are you?